Remy Pages is a Ph.D. student in the School of Education with a specialization in Educational Policy and Social Context (EPSC). Born and raised in France, Remy migrated to the U.S. as a language instructor, working first at the World Bank and then at the Foreign Service Institute for the State Department. Next, he moved to the San Francisco Bay area, consulting as a linguist for various tech companies while obtaining a B.A. in Mathematics from the University of California at Berkeley. 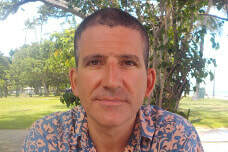 Attracted towards education, Remy followed with a year of teaching in high school in Hawaiʻi. Subsequently, he was employed as a graduate student researcher at the University of Hawaiʻi at Mānoa where he also obtained a M.Ed. in Educational Psychology, specializing in Statistics, Measurement and Evaluation. Remy's current research interests include behavioral economics of education, sociology of education, teaching evaluation, formative assessment, and interventions impacts persistence.